Chimi Lhakhang is a Buddhist monastery located in the Punakha district of Bhutan and was built by the 14th hierrarch of Drukpa, Ngawang Choegyel in 1499. 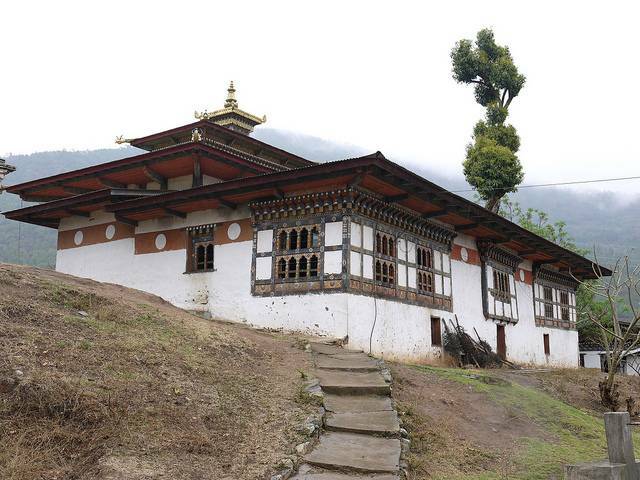 It is believed that he built this monastery after being blessed by the “Divine Madam”, the marverick saint Drukpa Kunley. To reach this site, you have to travel for 10kms from Punakha and then a 20 minutes walk from the nearby village of Sopsokha. During your walk you can notice sevral colorful prayer flags all along the road. The monastery is a golden roofed building with a row of prayer wheels and a small Chorten (stupa) just at the entrance. The outside walls of the monastery are full of carved images of different saints. The Mad saint’s colourful life is also depicted on some frescoes painted on the walls. Inside the prayer hall you can see bells, drums, horns, dorjis thangkas and tantric paraphernalia. There are also images of Sakyamuni buddha and Zhabdrung inside the monastery.